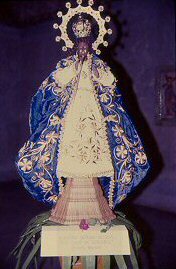 The image is one of the oldest Marian images in the Philippines. Its origin is unknown but it was reported to have been honored by the natives before the arrival of the Spaniards in 1521. 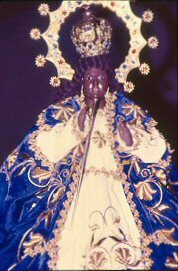 The Virgin became the center of prayers and petitions to whom the safety of sailors, ships and their cargo was entrusted. She became the guiding light for their safe journey and success. The image survived the bombings of World War II, and is presently in the Ermita Church in Manila. Filipinos who have applied for overseas work often pray to the Virgin that their applications will be approved and they are seldom disappointed. Once, when a fire broke out in a crowded neighborhood near the church, the image was placed between it and the nearby houses which were in danger of being destroyed. Within seconds the fire died down.